CSIRO Staff angry at failure to secure funding. Despite the failure of the CSIRO Executive they still continue to accept huge bonuses that lower paid staff could only dream of having as a basic salary. They defend their bonuses on the basis that it is the governments fault and not theirs that the organisation is shedding staff like passengers exiting the Titanic. Unfortunately, it would seem that CSIRO staff seem to disagree about where the responsibility lies. An internal report into staff morale at Australia’s peak science and research body has revealed the CSIRO’s employees are frustrated at the organisation’s inability to secure adequate funding from the Government. The Commonwealth Scientific and Industrial Research Organisation earlier this year fell victim to a $115 million cut in funding over four years as part of the Government’s federal budget. The organisation has been forced to take the razor to its workforce as a result, with up to 800 jobs in the firing line in the 2014-15 year, and another 80 expected to go in 2015-16. The CSIRO had already been attempting to cut costs following an internal review into its operations, which resulted in 477 workers being let go over the last 12 months. Additionally, up to 600 non-ongoing and contract workers will also lose their jobs as a result of the federal government’s public sector hiring freeze, with contracts not to be reinstated when they come up for renewal. The results of an internal survey of morale published [pdf] today by the Community and Public Sector Union (CPSU) has revealed the restructuring has taken its toll on the organisation’s staff, suggesting the workforce has little confidence in the CSIRO’s senior management. Two thirds of the 1239 surveyed staff – most of whom had worked for the CSIRO for at least six years – believed the organisation’s leaders lacked a clear vision for the CSIRO’s future and were incapable of clearly communicating a direction. Most also conveyed a “strong sense of disappointment” with the CSIRO’s efforts when it comes to effectively working with external stakeholders – particular Government – to secure funding. “The personal impact of the changes were generally appraised negatively, with the majority of respondents feeling challenged, threatened and uncertain about the current environment in CSIRO,” the report on the survey revealed. Research and science staff were the largest group to report feeling threatened and uncertain about changes taking place within the organisation. The Community and Public Sector Union yesterday revealed 75 researchers in digital productivity, agriculture and manufacturing would be let go as part of the already-announced jobs reduction. But despite a current environment of uncertainty, the majority of survey respondents said they remain committed to the goals and objectives of the organisation, and are willing to work beyond what was required to ensure the success of the CSIRO. However, staff weren’t so keen to recommend working at the CSIRO – only just over half of the 1239 surveyed staff (which equates to about a quarter of the CSIRO’s 5000-strong workforce) said they would endorse the organisation as a good place to work. To address the feeling of uncertainty particularly among science and research staff, the CSIRO said it would ensure senior leaders provided such staff with information on how their work would be impacted. To combat the “low morale and uncertainty” repeatedly raised by survey respondents, the CSIRO said it would push senior leaders to open up communication and keep “surprises to a minimum”. It also said it would provide opportunities for staff to voice opinions and receive acknowledgement of their experiences to increase clarity about the “strategic aspects” of the changes. “Organisational transformation, whether undertaken in response to shifting priorities or a difficult economic climate, is not without its challenges,” the survey report stated. The CSIRO has been contacted for comment. The following article appeared in the Guardian newspaper. Poor morale and a lack of faith in senior management is certainly not new. Anyone remember the survey which CSIRO independently commissioned and then refused to release because it was so scathing? Instead CSIRO management elected to conduct their own “in-house” morale survey which consisted of a sample group of some 20 or so management and HR staff who reassured CSIRO that everything was alright! Faith in CSIRO management was also way down; just over one in three believe the organisation’s senior leaders “have a clear vision for the future”, and fewer say they “communicate a clear direction” for the agency. Poor morale was the major theme, with “uncertainty, cynicism, loss, confusion, distrust, disengagement and fear” featuring in one in four comments left by staff. The CSIRO’s board signed off on a major restructure of the organisation in February after years of dwindling external investment, and in anticipation of deep cuts in the Abbott government’s first budget in May. In the 10 months that followed more than $100m has been cut from the organisation’s federal funding and more than 700 jobs have been lost. Another 75 full-time positions were also revealed to be facing the axe this week. Staff numbers are expected to drop more than 20% over the course of the restructure, from 6477 employees in June last year to about 5,200 people in June 2015. The survey found the restructure was “generally appraised negatively, with the majority of respondents feeling challenged, threatened and uncertain about the current environment in CSIRO”. “More than half of respondents felt they had been impacted ‘quite a bit’ or ‘a great deal’ by the changes,” the report said. Though “low morale and uncertainty were repeatedly stated in comments”, the CSIRO’s scientists, engineers and support staff remain firmly committed to the organisation. The number of staff who said they “believe strongly in the goals and objectives of the CSIRO” remained virtually unchanged at 80% since the last poll in 2012. And 81% said they were still willing to “to work beyond what is required” to see CSIRO succeed, a strong figure, but down 10% on the survey two years ago. A CSIRO spokesman said the agency was “undergoing a large restructure, including the loss of some roles and people, and we knew that was going to be disruptive”. “So what we are doing is making sure senior management get out to the work sites to talk with staff to show they acknowledge the magnitude of change, listen to people’s concerns and provide as much clarity as possible on matters that affect staff,” he said. Catriona Jackson, the chief executive of the scientists’ lobby Science and Technology Australia, said CSIRO management was to be congratulated for running the survey in a time of such uncertainty for the organisation. But she said the results were “depressingly unsurprising” and had “serious implications for Australia as a country”. “When we see an organisation in which a little over half are still prepared to say it’s a good place to work, that’s a serious problem,” she said. CSIRO Staff Association secretary Sam Popovski said the survey was disturbing and “paints a picture of a dedicated workforce that has been demoralised by a year of constant cutbacks”. “It underscores the size and gravity of the problem that incoming chief executive Dr Larry Marshall must immediately address when he takes the reins in January,” he said. Hundreds of scientists took part in unprecedented protests against the federal government’s budget cuts to the agency in June. The education and outreach budget has also been slashed by one-third, at the cost of 42 jobs and the children’s science club Double Helix. 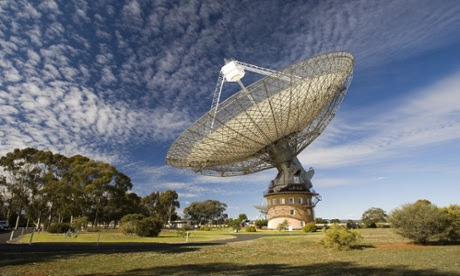 The Parkes radio telescope, which helped beam the first moon landing in 1969, could also shut to meet the required savings.